I think we forget how amazing Cybill Shepherd was and is. Charismatic. Gorgeous. Apart from the music, both theme and incidental, the show doesn't feel terribly dated. I don't remember if it tones down a little or not, but Bruce Willis is trying a little too hard in these first few episodes. Same as with any show more than a certain number of years old, it would have to be half the length if made today, since characters would just use google and solve the mystery in about two minutes. "Hmm. What could these numbers be? Let's research and brainstorm all night." Then drive to the Hall of Records to put the longitude and latitude to a map once figured out. Now: "Google the numbers. Search result one is a map showing the exact spot. Look at the spot in street view, see that clock? Let's go ..."
The freeze frame at the end of episode 2 was really unfortunate. As that final scene started it, I remembered in a vivid flash that's how the episode ended. 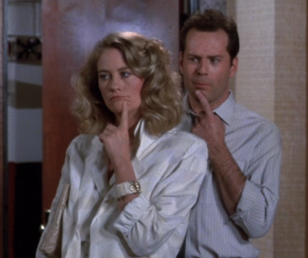 Not that it was that similar, but watching Moonlighting reminded me how much I liked and miss Life.